The FCW system is active at speeds of approximately 10 MPH (15 km/h) and above, when the system turns on. When FCW is turned on, FCW Indicator (white) will turn on. FCW system is activated using the settings menu on the information display. For additional information, refer to “How to enable/disable the FCW system” using the settings menu in this section. Perform the following steps to enable or disable the FCW system. Press the button until “Settings” displays in the vehicle information display. Use the button to select “Driver Assistance”. Select “Driver Aids”, and press the ENTER button. 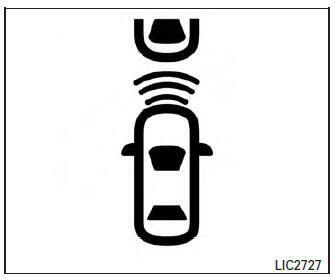 The FCW indicator will illuminate on the Vehicle Information Display when the system is on.